Solutions - Shields Communications Service, Inc.
You have needs, we have solutions. Shields Communications uses only the highest quality products with proven reliability. Each product line Shields uses comes with an extended warranty whose requirements Shields meets or exceeds. CommScope is a world leader in the design and manufacture of ‘last mile’ cable and connectivity solutions for communication networks. Through their SYSTIMAX Solutions and Uniprise brands, Commscope is the global leader in structured cabling systems for business enterprise applications. Commscope is also the world’s largest manufacturer of coaxial cable for Hybrid Fiber Coaxial (HFC) applications. Backed by strong research and development, CommScope combines technical expertise and proprietary technology with global manufacturing capability to provide customers with high-performance wired or wireless cabling solutions. Corning Cable Systems, the world's largest manufacturer of fiber optic communications products for data, voice, and video applications, features LANscape Fiber Optic Cabling Solutions for Private Networks. To protect your LANscape Fiber Optic Cabling Solution, Corning Cable Systems offers the LANscape Extended Warranty. The warranty covers each product component as well as the total performance of your Corning Cable Systems cabling system. Corning Cable Systems guarantees to repair or replace defective products free of charge after installation. Corning Cable Systems' network of nationwide Extended Warranty Program (EWP) installers are carefully selected. Each member-company meets our stringent requirements for technical experience, financial strength, and proven dedication to quality. EWP installers must demonstrate ongoing commitment to extensive factory training and are required to update training at least once every two years. Shields Communications is a member of the Corning Cable Systems Extended Warranty Program and is authorized to offer the 25-year year Corning Cable Systems Extended Warranty for qualifying installations of Corning Cable Systems LANscape Fiber Optic Cabling Solutions. 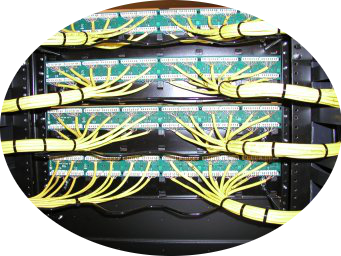 Shields Communications is a certified Krone structured cabling system installer. Krone is an international leader in data and voice connecting hardware technology-delivering high quality, high performance products to over 140 countries around the globe. TrueNet is the product of two wiring system technology leaders, Krone, Inc. and Prestolite Wire Corporation. These distinguished companies have combined resources to offer a structured cabling system that delivers zero bit errors. This revolutionary new system is fully-backed by a single-source, end-user warranty. TrueNet attests to the company's interest in providing far-reaching cabling solutions. In concert with Krone, Prestolite looked at the entire structured cabling system-while in operation - and then designed and developed cabling products that ensured not just Category 5, 5e or 6 compliance, but uninterrupted data throughput. TrueNet cable is based upon a patent-pending technology called TrueMatch . This product design and manufacturing innovation fine-tunes each cable to achieve operating impedance of 100 +-3 ohms. The cable is also tuned to the various system components, such as connectors, to achieve 100+-3 ohms impedance throughout the cabling system from NIC to server. TrueNet covers all aspects of the structured cabling system for horizontal and backbone networks that support data and voice, both copper and fiber, including patch cords, horizontal cabling, jacks and patch panels. Krone and Prestolite offer a "20/5" TrueNet Warranty. A 20-year all inclusive industry standards compliance warranty, including all parts, labor and technical support. Plus, a 5-year throughput warranty guaranteeing zero bit error rate performance from your structured cabling channel. Shields is proud to offer solutions based on the Berk-Tek / Ortronics technology alliance called NetClear. NetClear Channel Solutions optimize network performance using perfectly matched and balanced components. They are designed to deliver maximum throughput and channel capacity with no bit error attributes to the cabling system. NetClear is a family of solutions that are engineered, proven and independently verified to exceed TIA/EIA requirements for channel capacity. An alliance of two industry giants, Berk-Tek and Ortronics, NetClear provides seamlessly integrated solutions that benefit from expert manufacturing and provide built-in signal-to-noise headroom. NetClear solutions are complete - UTP and optical fiber, horizontal and backbone cabling, cross connect, workstation outlets, and high-performance patch cords with patented plug design. NetClear Channel Solutions: designed to provide the highest signal strength at the receiver-minimizing unwanted effects caused by noise, designed to be perfectly clear . The result: maximized dynamic performance for real world networks. There is a NetClear Solution for every network configuration and application. All NetClear solutions have a 25 year warranty from date of installation! The NetClear GT Enhanced Category 5e solution provides a total usable bandwidth of 155 MHz for a channel capacity of 1.5 Gigabits per second. The NetClear GT horizontal channel solution is engineered to significantly surpass all requirements of Category 5e applications and optimize capabilities for future applications. NetClear GT guarantees installed static channel performance 6dB* above all Category 5e crosstalk requirements for standards compliant designs/installations with field verification by NetClear approved handheld channel testers. *6dB within the accuracy of the tester at the point of test. Tests for attenuation are excepted. The NetClear GT2 Category 6 solution provides a minimum usable bandwidth of 250 MHz for a channel capacity of 3.0 Gigabits per second. The NetClear GT2 guarantees installed static channel performance 2dB* above all Category 6 crosstalk and return loss requirements for standards compliant designs/installations with field verification by NetClear approved handheld channel testers. *2dB within the accuracy of the tester at the point of test. The NetClear GT3 horizontal channel solution is engineered to significantly surpass all requirements of Category 6 applications and optimize capabilities for future applications. The NetClear GT3 channel will provide industry leading dynamic performance with application warranties. NetClear GT3 guarantees installed static channel performance 4dB* above all Category 6 crosstalk requirements and 3dB above all Category 6 return loss requirements for standards compliant designs/installations with field verification by NetClear approved handheld channel testers. *4dB within the accuracy of the tester at the point of test. Tests for attenuation are excepted. The NetClear MM1 fiber optic solutions feature GIGAlite™ multimode fiber, guaranteed to support Gigabit Ethernet to industry leading distances, and are engineered for high-speed performance in the horizontal, backbone, and campus fiber optic structured cabling system. NetClear MM1 solutions guarantee performance well beyond the IEEE and Fibre Channel distance limitations for standard multimode fiber optic cable. NetClear MM1 fiber solution was developed to facilitate advanced network requirements. NetClear MM1 offers horizontal, backbone, and campus fiber solutions that guarantee performance and network longevity. The NetClear MM1 solution is supported by Berk-Tek's GIGAlite optical fiber which provides not only outstanding overfilled launch (OFL) performance for legacy LED based networks, but also industry leading restricted mode launch (RML) performance for high speed VCSEL based systems like Gigabit Ethernet. All NetClear MM1 solutions guarantee extended Gigabit Ethernet distances. The NetClear MM10 fiber optic solutions feature GIGAlite™ -10 multimode fiber, guaranteed to support 10 Gigabit Ethernet to industry leading distances, and are engineered for high-speed performance in the horizontal, backbone, and campus fiber optic structured cabling system. NetClear MM10 solutions guarantee performance well beyond the IEEE and Fibre Channel distance limitations for standard multimode fiber optic cable. Berk-Tek's GIGAlite-10 and Ortronics ORMMAC products are part of the NetClear MM10 precisely engineered solution. NetClear MM10 fiber solution was developed to facilitate advanced network requirements. NetClear MM10 offers horizontal, backbone, and campus fiber solutions that guarantee performance and network longevity. The NetClear MM10 solution is supported by Berk-Tek's GIGAlite-10 and GIGAlite-10XB optical fiber which provides superior performance for 10 Gb applications (at 850 nm) by ensuring specifications that meet or exceed industry requirements. This superior level of performance can only be verified by measuring Differential Mode Delay (DMD) on each fiber. DMD is the difference in arrival times of the various modes of light traveling down the core of a multimode fiber. DMD is the only true method to verify 10 Gb/s performance as all modes across the fiber core are checked. Test methods developed by TIA/EIA and ISO/IEC ensure compliance (TIA-455-220 and draft IEC 60793-1-49) for DMD measurements. Gigalite-10 and GIGAlite-10XB fiber also exceeds DMD specifications as called out in TIA-492AAAC and draft IEC-60793-2-10. All NetClear MM10 solutions guarantee extended 1 Gb/s distances. NetClear SM fiber optic solutions feature singlemode fiber, guaranteed to support Gigabit Ethernet and 10 Gigabit Ethernet to industry leading distances, and are engineered for high-speed performance in the backbone, and campus fiber optic structured cabling system. NetClear SM solutions guarantee performance well beyond the IEEE and Fibre Channel distance limitations for standard singlemode fiber optic cable. The NetClear SM fiber solution was developed to facilitate advanced network requirements. NetClear SM offers backbone and campus fiber solutions that guarantee performance and network longevity. The NetClear SM solution is supported by Berk-Tek's singlemode fiber which exceeds the requirements of EIA/TIA-492CAAA "Detail Specification for Class IVa Dispersion Un-Shifted Singlemode Optical Fibers" as well as ITU recommendation G.652, "Characteristics of a singlemode optical fibre cable.". Low attenuation and superior fiber geometry also allows for low-loss fusion splicing and improved results during field termination. Berk-Tek's singlemode fiber offers virtually unlimited bandwidth which supports seamless network migration through transmission speeds in excess of 40 Gbps. NORDX's family of structured cabling systems provides a choice of several levels of system performance to best meet the needs of today's diverse cabling networks. Each is composed of fully integrated, beyond industry-standards products. The quality of our components, our superior design and expert installation is what sets IBDN apart from other structured cabling solutions. NORDX IBDN family of structured cabling systems provides you with a choice of four levels of system performance to best meet your needs; each composed of fully integrated, standards compliant products. NORDX/CDT has developed a global network of Certified Systems Vendors (CSVs) who have been fully trained on the design, installation and maintenance of IBDN Structured Cabling Systems. Whether you're installing an IBDN System for one office, an entire building, or a multi-building campus locally, nationally or internationally, the use of an authorized IBDN Certified System Vendor is your assurance of a quality installation and superior post installation maintenance. The components installed in your IBDN Certified Structured Cabling System will be warranted for a period of 25 years from date of installation against defects in materials and workmanship. For the same period, these components are warranted to meet or exceed the specifications of standards organizations including ISO/IEC CENELEC and TIA/EIA for the category of IBDN system installed. Ortronics the performance and flexibility people, provide network solutions for high performance, high capacity structured cabling systems that support multimedia environments and technologies. Member of IEEE, ANSI, TIA/EIA, CEDIA, ISO, NSCA and other industry standards groups. Every component works together to deliver electrical performance that exceeds ISO/IEC and TIA Category 6/Class E standards. NEXT is improved by 400%. The ratification of Category 6 accelerates the migration to highly-reliable gigabit capable infrastructures. The SYSTIMAX LazrSPEED Solution offers a cost-effective, low risk route to reliable LAN communications in the Gb/s range. SYSTIMAX TeraSPEED - a Zero Water Peak Singlemode (ZWP-SM) Fiber, designed to cost-effectively future-proof enterprise campus and metro backbones for next generation equipment. TeraSPEED ZWP-SM fiber is designed to operate over the entire wavelength range from 1280nm to 1625 nm - removing the water peaks (high attenuation) in the 1400 nm window -increasing the useable wavelength range over conventional singlemode fiber by more than 50%. TeraSPEED delivers a cost-effective upgrade path allowing up to 16 channels of CWDM (Coarse Wave Division Multiplexing), the lowest-cost option to pack more channels on a single fiber, and up to 400 channels of DWDM (Dense Wave Division Multiplexing). With bandwidth requirements continuing to grow at exponential rates, the TeraSPEED Solution is ready to support enterprise campus and metro backbone migrations to higher speeds and multiple wavelengths. In addition, this full spectrum fiber provides customers with future proofing options: if optical electronics move to higher serial speeds or shift to an increased number of wavelengths, TeraSPEED provides complete support for both. TeraSPEED fibrer cables are ITU-T G.652.C compliant and support legacy transport equipment and applications. The TeraSPEED ZWP-SM Solution follows the success of the SYSTIMAX LazrSPEED . With the InstaPATCH System, 96 fibers can be ready for service in the time it takes to install a single connector in the traditional installation process. This can be very important for installations that are time sensitive, where network downtime or network turn-up time must be kept to a minimum. Customers can have interconnect and cross-connect patching systems in service in an instant. The new system combines the proven, cost effective 10 Gb/s performance of LazrSPEED fiber with the highest fiber connector density in the industry. In sectors such as financial services, where demand for instant information is growing dramatically, the new system makes it easy to add fiber bandwidth as soon as it is needed. Every fiber and copper port connection is continuously monitored, verified and logged in a central database. Whenever there is an unplanned change on any panel, the system can be configured to trigger notification via pager, email and even calling your phone. Automated work orders and updating of the iPatch database, connectivity maps and logs save administrators' time. And, one touch cord tracing and patching guidance displayed on communications room racks let technicians work fast and get it right first time. The SYSTIMAX 110 VisiPatch System ensures fast, easy installation with low operating costs, enabling an organization to reduce labor and administrative expenses. With the 110 VisiPatch System, a perfect cord connection is really the only option, ensuring minimum risk of downtime at all times. The 110 VisiPatch System's revolutionary design ensures that IT professionals have greater control and management of an "organized" IT system, making it easier and quicker for them to do their job. Our SYSTIMAX 110 VisiPatch System is the next generation in patch panel design. This system retains all the benefits of our proven 110 insulation displacement connector technology, but goes far beyond this with new features that cut costs, reduce risks and give the patch panel an organized, professional appearance. CommScope offers Uniprise Solutions encompassing copper and fiber with a wide range of connectivity choices, all with performance guarantees above standard. Uniprise Solutions provide strength through integration: your network is stronger, not simply because the products are optimized for maximum performance, but also because we integrate training, warranty, and the expert knowledge and resources that come only with CommScope, an industry leader for more than 25 years. Uniprise Solutions are available for Category 6 and Category 5e. Our copper connectivity is interchangable within standard, meaning there's no changing panels or outlets if you upgrade. CommScope takes a flexible approach with our fiber optic solutions. We publish channel distances based on the amount of combined connector and splice loss, instead of just industry standard lengths. This allows for flexibility in design, and choice of our ST, SC or LC connectors, all of which have excellent performance characteristics. CommScope's four multimode solutions allow for the most cost-effective deployment of enterprise LAN network infrastructures. Uniprise multimode solutions include LaserCore and 62.5 micron solutions. Whether your network calls for 10 Megabit or 10 Gigabit, our fiber optic solutions meet or exceed industry standards. CommScope offers a premium singlemode solution, which allows network designers to fully utilize the entire optical spectrum: Lightscope ZWP trade Solution. Our Lightscope ZWP singlemode fiber was the industry's first full-spectrum singlemode fiber, which takes advantage of the previously unused E band. With the convergence of voice, video and data onto a single network, fiber choices can be confusing. Our LightScope ZWP solution, however, allows for the greatest flexibility and cost-effective deployment of converged networks, and is fully backwards compatible with existing single mode networks.